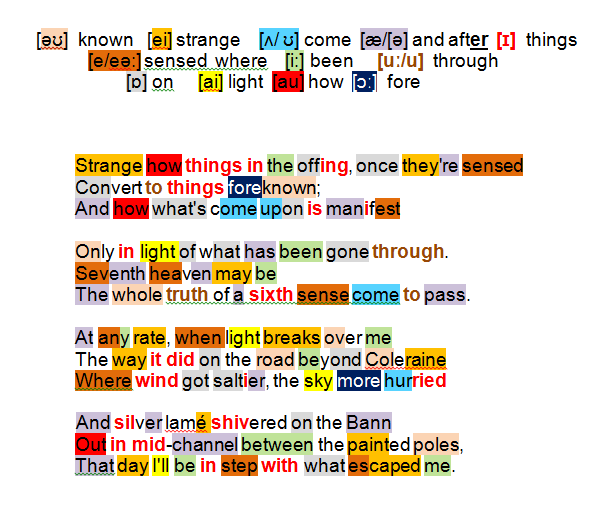 (DODp.325) Heaney reported on a period of feverish activity as the Seeing Things collection was taking shape: I was pouncing for twelve lines on all kinds of occasions, chance sentences from my reading, chance sightings of dictionary entries, such as ( ) ‘offing’. The final Squaring should be read as a complement to the previous piece in which ‘offing’ occurs for the first time. In Squarings xlvii Heaney signifies that his poetic radar is in constant scanning mode. When he assesses it he finds that the way his mind operates is odd (strange how …) The eye-scan data entering his consciousness (sensed) from distant reaches are déjà-vu (things foreknown) … amorphous early recollections that crystallized, random events (what’s come upon) that acquired significance via life’s general dynamic (in light of what has been gone through). In Heaney’s case the marvels of earthly existence he has discovered on the road are exalting (seventh heaven), of genuine marvel-status (the whole truth) thanks to the poetic ‘method’ of ‘Seeing Things’ that enabled them (a sixth sense come to pass). But enough of abstract thought, he suggests (at any rate). Heaney is waiting for a moment of revelation (when light breaks over me) like the one that occurred one day on the road beyond Coleraine. He recalls his senses filled to overflowing: touch/hearing (wind); taste/smell (saltier); sight and movement (sky more hurried); ‘shifting brilliances’ (silver lamé shivered) above earthly signs of safe navigation (in mid-channel between the painted poles). When revelation strikes the poet will realize he has succeeded in giving true credit to the wonders he failed to recognize first time round (in step with what escaped me) … ‘a glittering epiphany’ (HV147). The poem’s heightened sensibility to sense data associated with moments of revelation corresponds with the final poems of other collections (Personal Helicon of Death of a Naturalist, On the Road of Station Island, Postscript of Spirit Level and Exposure of North. In a collection that ponders the meaning and shape of memories of the ‘earliest self’ and the impact of time upon them Heaney explained it to DOD (p.31) as a space ‘that is necessarily vague and ( ) bound to be affected by ways of knowing and feeling that literature and culture offer you. I must have had this image of the little me as the animula, the little soul alone’. He goes further: early feelings become locked in ‘behind all kinds of socialized defences , barriers he learned to put up’. In this final piece of the Squarings sequence Heaney suggests that ‘Seeing Things’ (the fresh approach; the re-examination of first order memories; the revaluation of old certainties) is still a personal development ‘work in progress’.